Used to serve a slice of roasted ox at the Ox Roasting on 22nd June 1911. 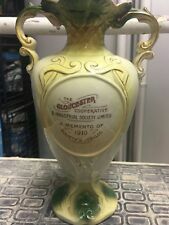 "Rare Collectable Plate Co-operative Society Jubilee". Age : 1911. George and Mary Silver Jubilee 1935. Congleton is in Cheshire north of Stoke-on-Trent. The base is marked with a CWS LONGTON / LABOR AND WAIT wheatsheaf backstamp. 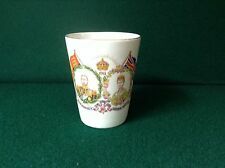 A fine quality 1911 Coronation Curved Sided Bone China Beaker by Royal Albert Crown China.